Extra Magic Hours is a prized perk that guests enjoy when staying in a Walt Disney World resort. Each day, one of the parks is open to resort guests either an hour earlier or 3 hours later than for non-resort guests. Beginning in January 2013, Walt Disney World’s evening Extra Magic Hours will decrease from 3 hours to 2 hours. This news sparked a lot of conversation online as to whether or not it is still a good deal to stay “on property” when visiting Walt Disney World. Certainly, what makes staying in a Disney resort appealing is very different for each person or family, based on their personal needs and desires. While it’s always hard to hear that one of the perks we enjoy is going away, I’d like to make the argument that the remaining benefits to staying on property still make it an option well worth choosing. 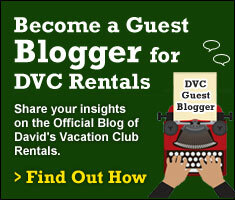 The benefits of being a Walt Disney World Resort guest begin even before leaving home. Within 10 days of arrival, guests can check in online to avoid the long lines at the resort’s check in desk. When you arrive, simply go to the online counter to pick up your welcome packet and room key. Resort guests have the option to add one of Disney’s Dining Plans to their reservation. For many, the option to include meals is a huge convenience and in some cases can even be a money saver. As a Disney resort guest you have the option to add charging privileges to your room key. Most anything that you purchase at the parks, Downtown Disney and most resorts can be charged to your room, eliminating the need to carry cash or credit cards around with you. You can buy tickets to all Disney parks and attractions and get information on dining, recreation, and everything Disney right in the lobby of your resort – without standing in the long, hot lines at the parks. With Magical Express, resort guests are provided complimentary round-trip transportation from the Orlando International Airport. In addition, Disney deals with your luggage. Once you arrive at the airport, all you have to do is hop on the shuttle to be whisked away to your resort. Later that day, your luggage will magically appear in your room. When it’s time to leave, you can check your luggage and print your boarding pass at the resort before boarding the shuttle. 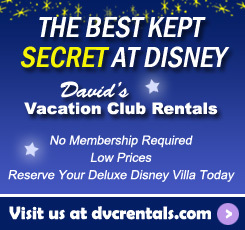 Transportation to the parks, Downtown Disney and to all of the Disney resorts is also free when you stay on property. Walt Disney World has a network of transportation options including busses, ferryboats, water taxis and monorails that make it possible to completely leave the driving to them while vacationing. If you’re like me and prefer the freedom of being able to drive while on property, you’ll be happy to know that as a resort guest, parking at the parks is complimentary. One of my favorite perks is the option to have purchases delivered to my resort. This means you don’t have to worry about those fragile Mickey martini glasses you bought for your brother getting broken while you’re bouncing around on Dinosaur. When you make your purchase, just let the Cast Member know what resort you are staying at and your purchases will be safely delivered to your resort at no extra cost. During busy times of the year when parks are close to capacity, being a resort guest gives you the best chance to avoid being turned away from entering the park. As I mentioned in the opening paragraph, resort guests enjoy extra hours in the parks by way of Extra Magic Hours. Even with the reduction of an hour off the evening hours, it’s still more park time than non-resort guests get. Back at the resort, guests can purchase a refillable mug that they can use for unlimited beverages for the duration of their stay at the resort. When you stay at a Disney resort you get more than just a bed and a shower – way more! 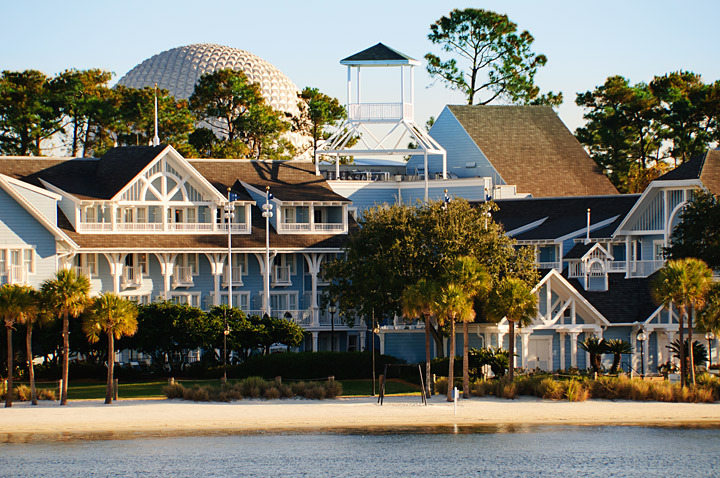 Disney’s resorts have exceptional pools, arcades, exercise rooms, children’s activities and areas. There are dozens of recreational activities such as fishing, tennis, boating, and golfing to name a few. Speaking of golf, resort guests get playing privileges, preferred tee times, and, in some cases, free transportation to the Disney golf courses. When you stay on property, you are close enough to your resort to take a mid-day break from the heat and crowds. It’s easy to go for a swim, take a nap and maybe have a bite to eat – fully recharging your system before heading back to the parks for an evening of more fun. Nobody knows how to cater to families better than Disney. Kids 17 and under stay free in their parent’s room and Disney has special services for children at the resorts, including child activity centers, in-room babysitting, learning programs and dinner clubs. The televisions in the resort rooms include the Disney Channel as well as several Walt Disney World info channels. You can even enjoy a nightly bedtime story on TV. Probably the best perk of all when you stay at a Walt Disney World resort is never having to leave the magic. There’s nothing better than being completely immersed in the Disney experience for your entire vacation. All the fantasy and fun, the amazing customer service and attention to detail that you find in Disney parks is also found in the resorts. Disney goes out of their way to make sure guests have the absolute best vacation possible. Granted, not everyone is going to take advantage of all the perks listed, all of the time. For instance, I travel between resorts a fair bit when I am there. I do use Disney transportation some, but I also rent a car which makes it easier to get from one resort to another. A refillable mug is completely wasted on me because I mostly just drink water – and the occasional refreshing adult beverage that isn’t included in the free refills. Many people do take advantage of most of the perks but even for those of us who don’t, when you look at the big picture with everything that Disney offers, staying at a Disney resort makes total sense (especially when you rent a Disney Vacation Club Villa). As to whether or not it’s worth it to stay on property – as far as I’m concerned, it’s not worth it to stay anywhere else!